A film titled “To Live,” directed by Zhang Yimou, shows us some of the dynamism of China’s modern history. From the last years of the Qing Dynasty, when many wore “pigtail” hair, to the Chinese Revolution to the Sino–Japanese War, the transition of power from the Nationalist Party to the Communists, the Cultural Revolution, and the current rapid economic expansion – these stormy changes in Chinese politics have influenced the lives of many common people in China. This city of Shaoxing is renowned for Shaoxing liquor, as its name suggests. Many Japanese know that towns famous for sake production have excellent sources of quality water. And Shaoxing is blessed with an abundance of water. Corridors of water form a grid pattern in the city, with old private houses standing alongside them. There, you see people washing clothes, cooking, and so on. The city is also the birthplace of Lu Xun, a famous figure of literature whose influence on the modern history of China was significant. He also studied in Japan. Lu Xun also lived in the storm of change, while writing down how ordinary people lived amid such a storm. Part of the joy of traveling is feeling the history of the places visited. 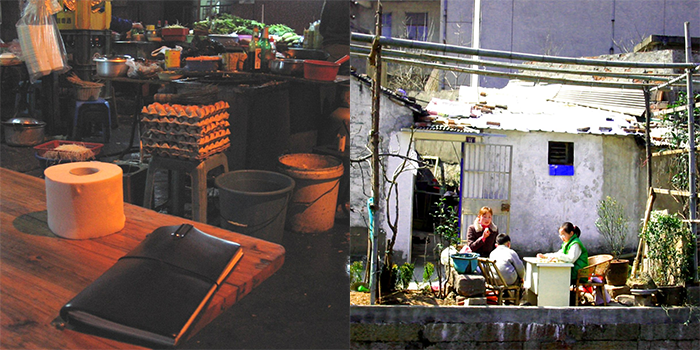 Photos show one of the several markets of Shaoxing. Step in there, and the stimulating smell of choudoufu welcomes you. Many residents of the city love this – well, very stinky – food. You will see more food stalls selling choudoufu than in any other city of China. Well, if you are not enough brave enough to try it, don’t worry – China has a great wealth of culinary arts, and there are many other foods you can savor, with ease! China is truly a giant country, hosting some 1.3 billion people in its vast territory. There is no way, therefore, to describe the nation in short. Still, once you visit China, you will sense some chaotic energy produced by the fusion of many, many different elements. This chaotic energy is the source of the nation’s recent rapid economic growth, as you can sense at many different places. At the same time, behind this economic growth, you can find some silhouettes from the past. This is part of the pleasure of traveling in China.